My family and I have just returned home from a little mini vacation to the beach (yippee!) and so the party festivities will actually begin just a tad bit later on this afternoon, maybe early evening. I need to be able to get things in order, lined-up and ready to go for the fun. One small ball of 100% cotton dishcloth yarn (such as Sugar and Cream, etc). You will only be using about 1/8th or less of a 2oz. ball. One netted bath scrunchy…like this. This can be a used one that is currently falling apart in your shower as we speak, lol…or a new one from the store. You can usually pick these up for a buck or two. I would say stick to the medium-large size, but if you can only find the small ones, then pick out 2. Your loom tool and a strong yarn needle. 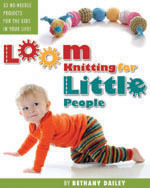 Another thing to do while you’re waiting for the party to begin is pop on over to my friend Tanya Goen’s blog and check out her absolutely adorable preview of the So Cool Cap from the new book, Loom Knitting for Little People! Tanya is our official graphic designer for this project and has been doing an absolutely amazing job on giving the book it’s whimsical and playful style…you’re going to LOVE it! 😀 Pop on over and let her know how much you love her sweet project! This entry was posted in Blogiversary, Book Progress, Free Loom Patterns, Loom Alongs, Loom Knitting, Looming Patterns, New Projects, Project Preview. Bookmark the permalink. Congrats on an amazing four years! Your talents shine through in every project you share. Thank you for your wonderful contributions to the loom knitting community and may we celebrate many more anniversaries. Congrats Bethany! P.S. Can’t wait for the book release. I’m excited and I think I have supplies on hand 🙂 Congrats Bethany! Hi Bethany…congrats to you…is this project open to everyone or just people who blog which I don’t have my own but look at others? Enjoy the sunshine today…looks like we finally got our summer. Off to a my nephews wedding this afternoon so should be fun. Congratulations of 4 absolutely fantastic years!! It’s been a pleasure to be even a little bit of a part of your looming sites and experiences. I’ve learned so much. Here’s looking to many many more years and LOTS of success and projects to come!! Yeahhh Go Gettin’ It Pegged, Bethany and family and friends!! Congrats on 4 years and much success, Bethany! Okay, one question, hopefully you’ll get back to me….my blue KK loom will be wrapped up for a while…you know how it can be. Can I use the pink one with the extra peg thingy that I can snap in? Or will that not be enough room? Yeah, have all the supplies. will try to check in when you start. Tried to leave a comment on your friends blog but would not take for some reason. Tried many times. But, she did an excellent job on the pattern! Hi Stacy! 🙂 Yes, it will be just fine to use your long KK loom with added loom clips…not a problem at all! Hi Candi! 🙂 Of course you can join along…it’s a party for everybody! I hope you enjoy! 🙂 Have a wonderful time at the wedding too…see ya’ when you get back!